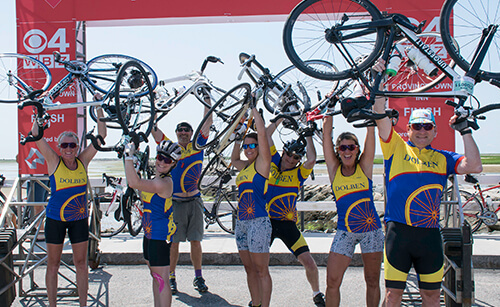 There are many reasons riders come together as a team to ride and fundraise – in honor or in memory of someone, to fund a specific type of cancer research, to bring colleagues together around a mission, and a myriad of other reasons. Teams can be made up of family members, friends and/or colleagues. Nearly three-quarters of PMC riders are part of a PMC team. Starting a PMC team? Use this form to get going. Each team member must register individually and is responsible for their own fundraising minimum for their chosen route. Once the team is created, the team captain can add each registered rider to the team. There is no additional cost or fundraising commitment to ride as a team. Teams may be as small as two riders and there is no limit on the number of riders who can be on a team. Teams can consist of virtual riders and riders who are riding different PMC routes. Team captains will be able to access their team tools through their personal PMC Manage pages. All riders are encouraged to wear the official PMC rider jersey on day one of PMC weekend. On day two, teams don their team jerseys. Need new jerseys for your team? Primal will donate 15% of team jersey orders back to your team’s fundraising. Team names will be reviewed by PMC staff. Please make sure your team name is appropriate, as the PMC is a family event. If you have any questions about PMC teams, please contact Jessica Otto. On Sunday of PMC weekend, it’s tradition for PMC riders on teams to wear their team jerseys. Get your team jerseys through Primal to receive a 15 percent donation to your team’s fundraising. For more information or to place an order, contact Stephen Blackband at Primal Wear at stephen.b@primalwear.com or 702-262-9152.